Last year, we stared the downside to living in the future straight in the face. After the NSA's PRISM program was revealed—which worked via access to the servers and networks of major tech companies—it got a lot harder to deny the worst conspiracy theories about being surrounded by gadgets with all sorts of geo-tagging/always-online/picture-taking capabilities. Today, people all across the U.S.—along with supporters around the world—are mobilizing to push back and fight for an open internet and online privacy. 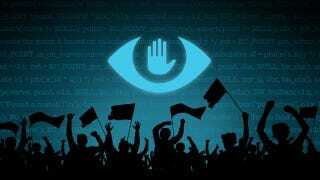 A movement in response to mass spying launches today under the name Today We Fight Back, under the #stopthensa hashtag. It's encouraging U.S. citizens to e-mail and call elected representatives to voice their opinions on key legislation. You might remember the PRISM fallout neatly dovetailed with last year's concerns that devices like the Kinect would be used to surreptitiously monitor people. Microsoft denied any participation in PRISM but the discussions put the issue on the map for many consumers. Over the past few years, we've seen the Internet as a political force make waves in Washington. From our defeat of the Internet censorship bill SOPA to our battles over CISPA, TPP, and patent reform, history has shown that we can activate our networks to beat back legislation that threatens our ability to connect, as well as champion bills that will further our rights online. It may seem like calling a congressperson doesn't do much but when they get thousands of people—people who put them in office—contacting them about an issue like this, it becomes something an elected official can't ignore.